Hello everyone, you are very welcome today! Last week my constant lurking on the Onyx Path Publishing blog yielded me more useful information about a gaming source book that I had been waiting for. Disclaimer, this post contains affiliate links. The source book was V20 Vampire the Dark Ages Companion. I hadn’t read an awful lot about the content of the book in advance, as I always assumed I would get it anyway since returning to Vampire, and embracing V20 Vampire the Dark Ages in a big way over the last six months. I wasn’t quite sure what to expect, as the companion books for the Vampire line of products are a bit random, adding details to the game that never quite made the core rules for the current edition. I was looking forward to V20 Vampire the Dark Ages Companion and, for the most part, I wasn’t disappointed. V20 Vampire the Dark Ages Companion is a source book for the Dark Ages line of V20, a storyteller roleplaying game. The vast majority of the book is given over to descriptions of six cities/towns of the Dark Ages setting. These descriptions detail the vampires that live within their borders, their reasons for being there, the domain history and intrigues. There is also an entire chapter devoted to building new domains, a chapter giving more details on medieval weaponry and streamlining the combat system, and finally there are clan apocrypha covering various legends, stories and practices of the various vampire clans. I will talk about each, though for reasons that should become clear I am writing about them in an order that differs from the book. The summons from the Prince had arrived the night before, an Owl dispatched via one of my agents in Cardiff. I was not over-keen to attend court as I was in the middle of excavating a shaft within my cave haven, however the owl that carried the message had been spooked by something greatly, so I deemed it wise to not ignore the summons. I gathered my travelling garb, instructed Ares and his pack to guard the haven whilst Athena and her brood served as eyes and ears. I reopened the gouge in my arm, now a corrupted and contorted mess normally hidden by armour, and spilled blood into the pool outside my cave. My jaunts to the city normally last several days and my creatures needed to be attended to. I howled into the night, signalling to Ares that I was leaving whilst also summoning Artemis to my side. I could only hope whatever errand the Prince had for me wouldn’t keep me away overlong. The vast majority of V20 Vampire the Dark Ages Companion is given over to six chapters about domains. These are Rome, Bath, Bjarkarey, Constantinople, Mogadishu and Mangaluru. Each chapter details the geographic setting, and describes the visuals and other sensual details of the locations before launching into brief descriptions of the prominent vampire populations within. The chapters then discuss, in varying detail, the things that make the domains prominent. For instance, in Rome their is a vampire who revels in excess who styles himself the Anti-Pope. It deals with the Antipope and his lackeys and how they relate to the more pious members of vampire society, and also the potential for mortal inquisitors to become involved. The chapter on Bath deals with Mithras worship by the Vampire population in medieval England, whilst the Scandinavian island Domain of Bjarkarey is the setting of a tyrant queen devoted to Norse Gods, and those that practice others faiths secretly. The strongest theme that came through in each domain was religion and the impact it had on medieval life. This was not the only theme, however it was the strongest. This is entirely fair and appropriate given the sway that religion had during the Dark Ages/Middle Ages, and the stories that can be generated as a result of the different religions/beliefs/cults coming into contact with other more accepted forms of worship are extraordinarily interesting. As player of this game, on and off, for years there was also a lot of information available within these chapters about things that I hadn’t encountered in other source books, including the origins of the secretive and mysterious Inconnu, the practices of Mithraists and information on more exotic locations and where the rarer Dark Ages bloodlines of Vampires (Such as Ramanga and Bonsam) fit into the world. I stood in the main annex of the Cathedral, Artemis waiting patiently for me outside the city limits. I was not alone. Elspeth, a new arrival to the domain of clan Gangrel, was present. She forced a smile. We hadn’t really spoken much since her arrival, a while back. She dresses in hunting leathers similar to mine, and tends to be more interested in function rather than form. “A powerful Ventrue Elder, with an army of fanatical followers in England. They don’t take kindly to anyone who doesn’t blindly obey them…” The Gangrel woman seemed genuinely afraid of this Mithras. The clan apocrypha is interesting, though I have to admit I do not believe I got the full benefit of it all. Each Apocrypha has some flavour fiction, and given it was written in the style of neat medieval I found it very hard to read some of these bits of fluff. Which is a shame. The Apocrypha was a bit of a mixed bag, with some clans having new rules available for different variants of clan member, different story ideas based on the hidden machinations of the clan, and in some cases it included new powers (though there were not many of those) for said clan. The Ventrue Apocrypha listed all known Ventrue 4th Generation Vampires, the Methuselahs. This was interesting as this clan places a lot of stock in lineage. A Ventrue player wishing to go into a lot of detail about their character now has named Methuselahs to choose from in their lineage, with the optional rule to add advantages and disadvantages based on the bloodline. For the Nosferatu, the apocrypha was more of a story hook about Elder tunnels beneath the Earth where only the bravest and most knowledgeable venture. I won’t go into any more detail here on the other clan Apocrypha. Menw was scouting ahead leaving Elspeth and myself. The tunnel was darker than a fiend’s heart, though this posed no problem to either of us. Elspeth’s eyes glowed red, casting the darkness back somewhat. The tunnel surface was smooth stone. Not dirt. Not piled stone. Smooth. And the wall was segmented, like the body of a worm. There was no wind or noise of any kind down here. “Why did your elder call this the bones of the Earth? What is this place?” Elspeth was glancing around, her shifting eyes causing the darkness to shift and retreat wherever she gazed. I ignored her question. Something wasn’t right, Menw should have been back by now. I allowed my hearing to search ahead of us for any sign of threat. I heard clicking. Click, Click, Click, Click. Something was moving, something strange. My statement was punctuated by a growl from Artemis cut off by my arts of Silence. Whatever I could hear, I could only hope it was in a different tunnel. Basically, in the old system players roll to hit, the defenders gets to react, if the reaction fails the attacker rolls damage (and this is where the unarmed peasant survives if you roll low despite lack of armour) and then the defender rolls their soak (the point where someone in plate armour can be eviscerated by a butter knife due to poor roll of the dice). In the proposed system, Attack and defence rolls still happen, however damage is applied based on a “Hardened” value (I won’t tell you how to find that, you need to buy the book) and then reduced based on soak value. Thus the new system has 2 dice rolls rather than 4, with more realism added to damage. Each action will be faster to accomplish, however combat will potentially take longer (As stupidly lucky hits shouldn’t happen so much, or at all) which feels somewhere between realistic and cinematic. The Mithraist Army camped in a clearing just beyond the forest. Three hours past midnight and six hundred men lay sleeping around the smoking embers of the cook fires, several guards walking the perimeter. Elspeth and I lurked in the shadows awaiting the next foot patrol, our orders to get into the camp and cause as much disruption as possible. Were I alone, that would have been easy. However, Gangrels do not have the same arts so we would need to use more standard intrusion methods. She lay flat on the ground, waiting. The foot patrol was a solitary man using a spear more as a crutch than anything else. He approached her position, paying only minimal attention, his eyes droopy with fatigue. He passed the prone form of my companion who leaped to her feet, her clawed hands raking across his throat killing him instantly. She caught his falling form before it could disturb nearby sleepers. And then a second patrol appeared. He was more alert and saw what had happened to his companion. Turning away, he tried to run and raise the alarm. He did not see me hidden nearby, arrow ready. He didn’t hear the arrow fly, being taken completely unawares as it plunged into his back. He fell forwards unceremoniously with a thump, and I could see several sleeping forms starting to move in response to the noise. So much for stealth. I howled into the night, telling Artemis it was time for her to do her part. Probably my favourite chapter within the entire book was Chapter 7, which was about how players can build their own domains within the game. For me, the appeal of V20 Vampire the Dark Ages has always been about creating a character and watching that character grow over the years. There is the image of Vampires accumulating vast wealth and legions of followers and lackeys as they grow older. This isn’t necessarily always the case, not entirely, however unless you want to play an entirely solo game then your character will make connections with mortals and may even deem a piece of territory as their personal hunting ground. For me, I actually like to play in mini stories in between the main chapters where my character is building alliances and networks necessary to stay one step ahead. The rules governing domain building are very useful in this respect. The chapter covers vassalage in the respect of the players controlling vassals, or even laying claim to settlements. There are augmented rules for building human ally non-player characters and even on making your personal domain more prosperous, defensible or easier to escape from (I really like the mechanism for applying “Secret Ways” to your domain. The army was in disarray. Rumours had flown through the camp that the Lordling commanding it had slain his war council breaking the loyalty and morale of the troops. When the horses stampeded, spooked by a lurking she-wolf, the army had scattered. It would take days to reassemble, if it ever did. Menw, Elspeth and I made good our escape in the confusion. My Elder scouted ahead leaving me to talk with the Gangrel. “Do you two do errands like this for the Prince often?” She asked. Information on Saulot and his relationship to the Baali (an ancient, spiritual vampire who apparently also created demon worshiping vampires) was unexpected and interesting. The Combat Chapter felt a bit like an afterthought, perhaps suffering as a lot of the combat systems appeared in Tome of Secrets. So, the good outways the bad both numerically and in terms of quantity. Most of the things I disliked were tiny niggles that I can get past. The various domains gave me quite a few ideas for my own stories, even if my players never make it to those specific territories. I have been planning a chronicle where players are encouraged to create their own domains and vassals, so chapter 7 was a boon. And the streamlining of the combat process, which is actually my least favourite thing about the game (I like games of intrigue and politics, with combat as a last resort or as a finale spetacle), was an absolutely welcome addition. 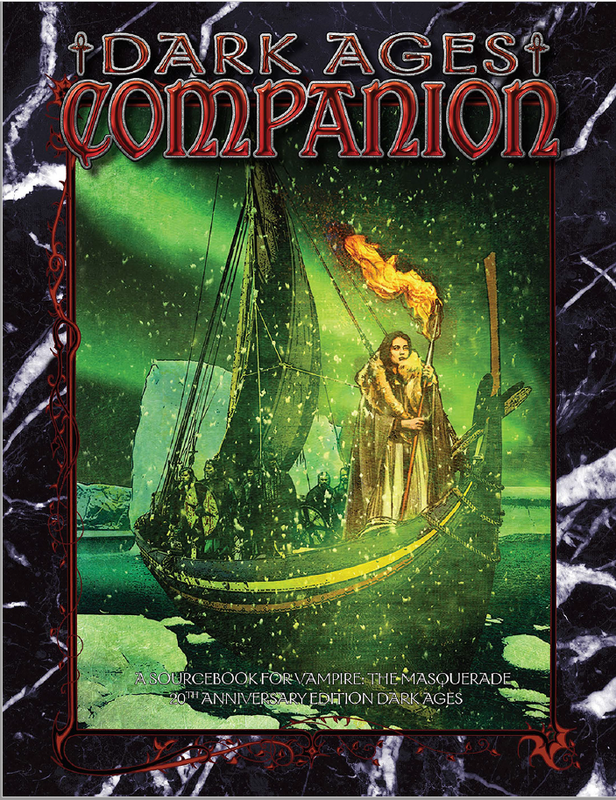 Currently (As of 24/05/2017), V20 Vampire the Dark Ages Companion is available as a PDF from Drivethru RPG, with the physical book being expected in the next month or so (purchase of the Advance PDF entitles you to a voucher that will allow purchase of the physical book at a discounted rate to balance the cost). V20 Vampire the Dark Ages Companion is a decent enough source book, though to fully benefit from its rules on Combat and Vassalage you probably want to get V20 Tome of Secrets too, if you don’t already have it (In many ways, Tome of Secrets is better value for money). I’d say, if you are an avid player of V20 Vampire the Dark Ages, then it is worth your while. If you are only an occasional player of the system, it is less necessary. Apparently I can’t like your comment. But I do. It was a good read, and gave me some ideas for games. Honest answer. Did you like the italicised stories?